Planning your team is important for your project and the PMP Certification Exam. Networking and talking with team members and other project managers is a good technique to get their expertise as input for effective organizational structures. Also, keep in mind organizational theories on motivation. You will want to assess what motivates individual team members. After all, some team members will be motivated by having a position of responsibility on the team, and others might be so overworked that they will be demotivated by taking on extra work. You can document team roles, responsibilities, and structure in different ways. Three of the most common are hierarchy charts, matrix charts, and text formats. Assume that you have a large project team consisting at least 50 or more people. You won’t see questions that assume a 6-member team, so if you’re used to managing projects with small teams, you have to adjust your thinking. Hierarchy charts are like organizational charts. You usually see them with the project manager at the top, with a subordinate project management team layer, and beneath that the project team layer. Another type of hierarchy chart is an organizational breakdown structure (OBS). This shows the organization of the team and is used to intersect with the WBS. 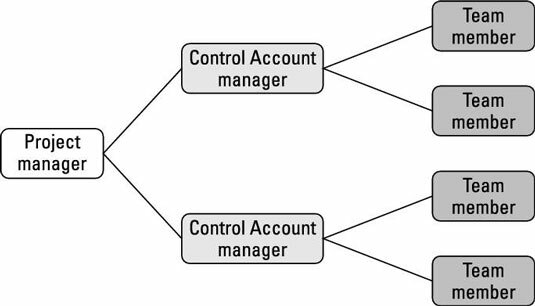 The layer under the project manager is the control account manager. The control account manager manages team members who work on specific work packages in the WBS. Organizational breakdown structure (OBS). A hierarchical representation of the project organization that illustrates the relationship between project activities and the organizational units that will perform those activities. A third type of hierarchy chart is a resource breakdown structure. Resource breakdown structure (RBS). A hierarchical representation of resources by category and type. An RBS is used in resource-leveling schedules and to develop a resource-limited schedule, and that can be used to identify and analyze human resources as well as material and equipment. Matrix charts show how team members are used on each deliverable. A responsibility assignment matrix (RAM) is the most common form of a matrix chart. Responsibility assignment matrix (RAM). A grid that shows the project resource assigned to each work package. You don’t have to use the same format. Some people use an ARIS chart, where ARIS stands for Accountable-Responsible-Inform-Sign-off. Use whatever works for you on your projects. Text formats describe roles and responsibilities, authority, and competencies. Role. The position on the team. It describes the type of work that needs to be done, such as writer, programmer, or electrician. A role usually coincides with a job title. Authority. The right to make and approve decisions. The person in the role of the contract administrator is usually the only person who has the authority to enter into or change a contract. Responsibility. The work the person in a particular role is expected to perform. The person with the role of an editor is responsible for reviewing all written content, ensuring that it conforms to the editorial guidelines and is easily understandable. Competency. Describes the skill or skill level of an individual. A Junior Plumber has the competencies to lay pipe and connect pipe following a set of blueprints. A Senior Plumber can actually design the plumbing to comply with standards and regulations. The thought and effort put into organizing your team and thinking through the roles and responsibilities will be reflected in the human resource management plan.